The breakfast area adjoins the clean and open cooking and prep area with easy access to all cooking equipment. The floors are Marmoleum, and provide a sustainable and easy to clean surface. Photography by Ocular Proof. Glimpse of the opaque glass door leading into the formal dining room. 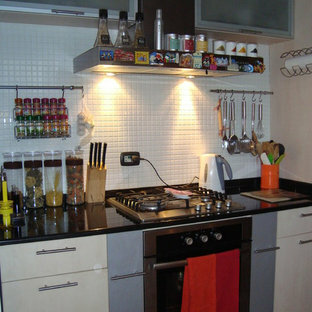 Specialty cooking appliances include a steam oven as well as a 'speed' oven which utilizes both convection and microwave cooking techniques. Lowered shelf for rice cook and/or crock pot. By S.J. 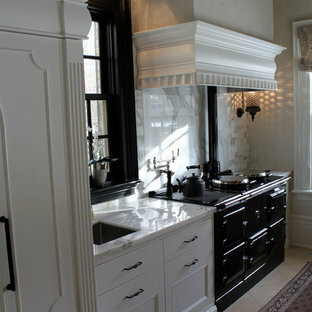 Janis Company, Inc.
Classic profiles and details bring a timeless elegance to this cooking zone and anchors the wall. 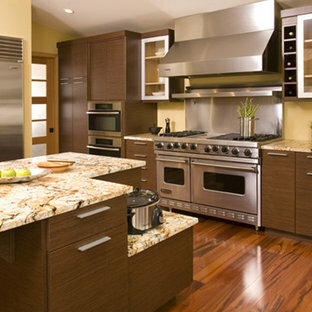 A Wolf 30" gas cooktop seamlessly integrates with the wood and granite surroundings. 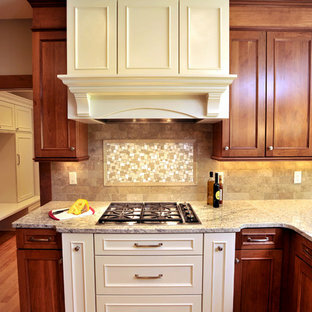 The custom mosaic tile backsplash finishes off the clean look creating perfection. 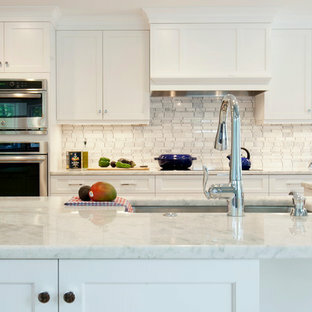 Another view into this crisp and clean white kitchen. Photography by Chrissy Racho. 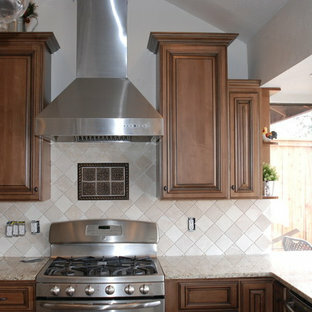 Aga Cooker with custom designed integrated ventilation hood. Pullout garbage below sink. 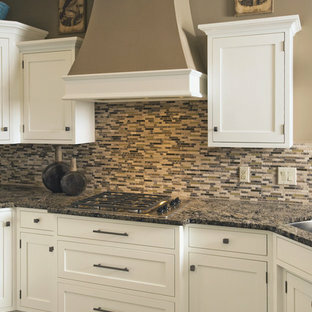 Marble counters and marble tile backsplash complete the highly refined look. Photo by Morehead Marketing, Inc. Photography by Eric Roth Photography Designed by Heartwood Kitchens, Danvers MA. The Heartwood showroom is located on Boston's North Shore. 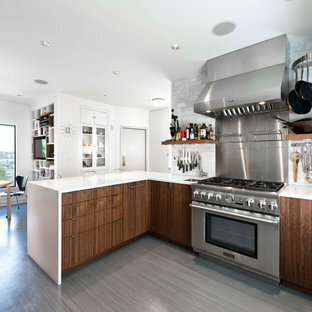 A personal kitchen for a professional chef. Photos by Philip Jensen-Carter. This Greenlake area home is the result of an extensive collaboration with the owners to recapture the architectural character of the 1920’s and 30’s era craftsman homes built in the neighborhood. Deep overhangs, notched rafter tails, and timber brackets are among the architectural elements that communicate this goal. Given its modest 2800 sf size, the home sits comfortably on its corner lot and leaves enough room for an ample back patio and yard. An open floor plan on the main level and a centrally located stair maximize space efficiency, something that is key for a construction budget that values intimate detailing and character over size.